This morning I was having a look at some of the groups I belong to on Ravelry to see what's new. I was excited when I saw this on the Pudding Yarn page. Pudding Yarn is a shop in Calgary. I've made a number of Kaffe's designs in the past, have one of the needles right now. It's the Triangle Squares cushion, available as a free download. I have plans to make more of his designs in the future. I have all the yarns and pattern to make Brandon's "Scales" (Rowan 38) and "Ease" (Rowan 49 - a man's pullover I'm converting to a woman's) patterns. Kaffe's patterns and his philosophy on knitting changed my way of thinking about knitting and I embraced it wholeheartedly. I love color, lots of color. Intarsia is one of my favorite techniques. It all fits. 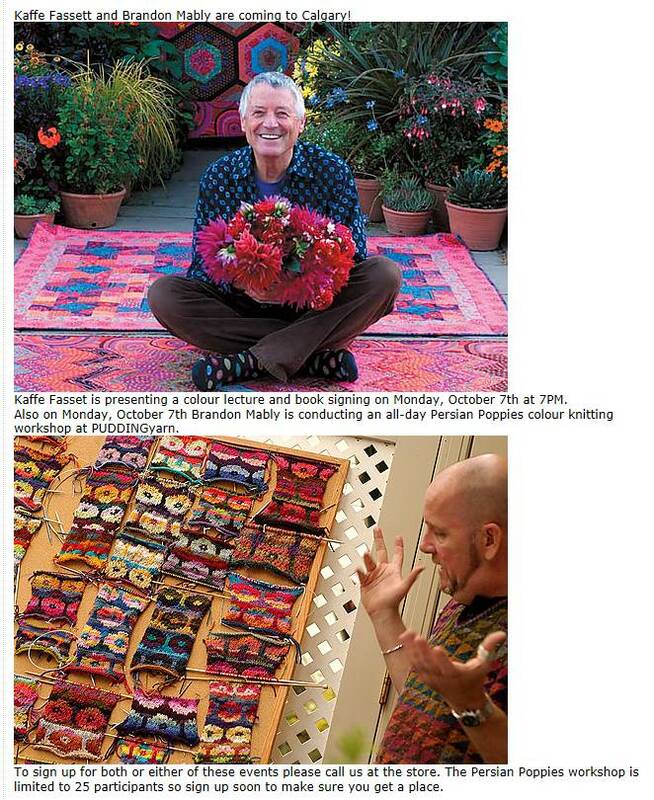 I had a chance to speak very briefly with Kaffe Fassett in Toronto at a show around 1992 and listened to one of his lectures in Denver sometime about ten years ago. It's going to be nice to take a class this time around. I've signed up for both the lecture and book signing as well as Brandon's class and looking forward to both. It's going to be quite a creative and inspiring day, I'm sure. It's so great to meet another person who loves intarsia. It's my favorite technique! I don't know why people are always so down on it. I am much of the way through Scales, it's a lot of fun.